“Oxford Union votes down motion on reunification of Ireland” read a recent headline in the Belfast Telegraph. It was the type of news story guaranteed to warm the hearts of delegates gathering in Belfast a few days later for the DUP’s annual conference. Coupled with the attendance at the event of Conservative Party heavyweights—the chancellor of the exchequer, Philip Hammond, and the barnstorming Boris Johnson—it appeared that the spirit of James Craig was smiling benevolently on the DUP and its assembled delegates. Yet for all the self-congratulatory backslapping there were more sombre assessments emanating from influential voices elsewhere within unionism. Arlene Foster’s party was suffering setbacks, they said, and the future of the Union was problematic. Powerful stuff, and offering little comfort to unionism. However, conditioned from its foundation, and by its founder, to speak loudly rather than to listen or seek accommodation, the DUP has traditionally resisted meaningful engagement with other political parties in the Six Counties or the Republic. Its electoral support was based largely on containing and resisting the political agenda of Sinn Féin, regardless of what that party or its voters asked for. In the North this negative programme has proved to be a winning formula for hard-line unionism, in the electoral arena at least. “No surrender” and “Not an inch” worked out fine for them, so long as little else was required, as all the while the DUP sought the return of an idealised status quo. The durability of such a strategy depended, among other conditions, on the British government being tolerant of, if not indifferent to, deadlocked inter-party politicking in Stormont. In the absence of an armed conflict, the political elite in London believed that the Irish in Belfast could be allowed to disagree for as long as they wished. 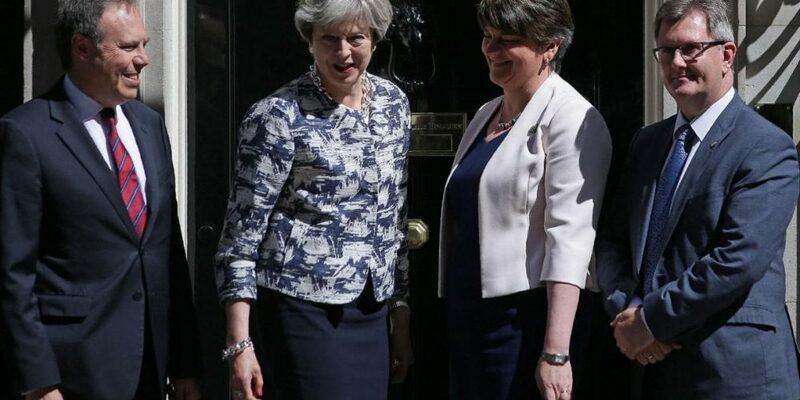 This situation changed for the DUP when, after the last general election, they entered into a “confidence and supply” arrangement with Theresa May’s Conservatives. While gaining a limited measure of influence over decision-making in London, Arlene Foster’s party has inevitably been drawn into the bitter infighting over Brexit that is engulfing the Tory party. 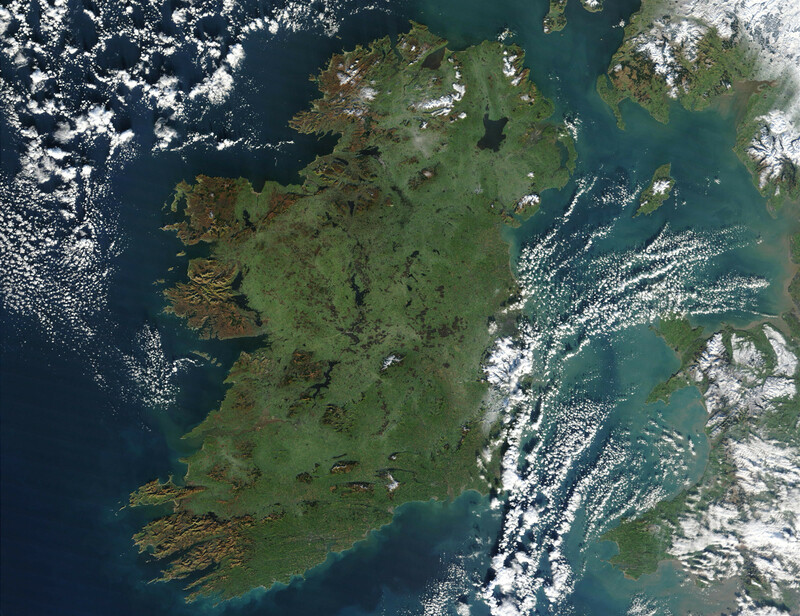 Not since the demise of the Irish Parliamentary Party at the beginning of the twentieth century has a political party from Ireland occupied such a pivotal position in English politics. Yet that is a two-edged sword. Long used to the stifling world of northern Irish politics, with its virtual absence of accountability, the DUP is now finding itself answerable for choices it makes in the more challenging atmosphere of an internecine Conservative Party feud. Whichever Tory camp they side with will inevitably alienate the other. The Tory party is a coalition of the British ruling class, and all within it are not necessarily in favour of Brexit. As an editorial in the Morning Star recently stated, divisions among the Tories reveal divisions in Britain’s ruling class, and woe betide those who back the losing horse in this contest!² For all those who come courting the DUP’s ten MPs there are others who see them as a threat, to be removed when necessary. The next general election may alter the balance of power through different parliamentary arithmetic; but there are other options in the undergrowth. Ominous for Foster and her colleagues is the option of ending partition. Obviously, if Northern Ireland were to leave the United Kingdom there would be no DUP voting in the House of Commons. Moreover, such a constitutional realignment would also, for some, temptingly negate the need for a “backstop” involving the border. Both scenarios are, for the time being, hypothetical. Nevertheless, the certainty of alienating at least one significant section of the Tory party while offering temptation to elements in both camps must make uncomfortable reading for Ulster unionism. Compounding their distress is the spectacle of divisions opening between the DUP and Northern Ireland’s business and farming sectors. For long, unionism has viewed the business class as a solid and dependable constituency, generally supporting the status quo but never openly critical of the dominant political party’s economic stance. This changed dramatically when Theresa May offered the Six Counties a deal promising access to both EU and British markets. The list of farming and business groups siding with the prime minister was impressive; among them were the Ulster Farmers’ Union, the Confederation of British Industry in Belfast, “Hospitality Ulster” (the tourist authority), NI Retail Consortium, and Manufacturing NI. Although Sammy Wilson angrily described the business spokespersons as mouthpieces for the Northern Ireland Office, his party leader knew better than to gratuitously insult them. Foster moved quickly. Firstly, she blamed the media for causing the divide, presumably for reporting the issue, and thereafter established a dialogue with this wealthy section of society. Nevertheless, unionist confidence has been damaged. An influential element within northern society, many of whom are instinctively pro-British, has indicated that its fundamental loyalty is to its own prosperity rather than to the Crown. None of which means that the Six-County political entity is about to collapse in the near future. However, when taken in consideration with other factors, such as rapidly changing demographics, Britain’s altered security requirements, and the failed political institution that is Stormont, the prognosis appears terminal. We can at least hold on to a reasonable hope that the structure that paved the way for our long carnival of reaction—south as well as north—is coming to an end. A century after the publication of the Democratic Programme of Dáil Éireann, the challenge for socialists is not to wait passively for events, or to entertain any sense of triumphalism. There is work to be done to ensure that we don’t endure another century of reaction emanating from a different source within the EU and supported by a native bourgeoisie with its headquarters in Dublin. James Connolly showed us the way, and his message remains as relevant today as when he sat writing at his desk in Liberty Hall. We must build a workers’ republic that guarantees the well-being of all working people living on this island; and, as always, that struggle begins today. *i.e. the arrangement for leaving the EU agreed by Theresa May with the other twenty-seven members. Sam McBride, “Peter Robinson in eve of conference warning to DUP on state of the Union,” News Letter (Belfast), 24 November 2018 (at https://bit.ly/2P1NzkW). Morning Star, Wednesday 21 November 2018.